A Game Changer for China and India in Sri Lanka? India may be celebrating the election result in Sri Lanka, but China is in the region for the long haul. On January 18, a Reuters reported claimed that Sri Lanka’s now former president, Mahinda Rajapaksa, had expelled the station chief of India’s intelligence agency in Colombo after accusing him of working against his government and supporting the opposition. India denied the claim, but the report serves as an example of Rajapaksa’s thorny attitude towards New Delhi, irrespective of the face presented by public diplomacy. The docking last September of a Chinese naval submarine in Colombo turned heads in New Delhi, just as the new government led by Prime Minister Narendra Modi was still getting up to speed. The event underlined the magnitude of Chinese influence in Sri Lanka under Rajapaksa, despite assurances from Beijing that the docking was a routine stopover to re-stock on supplies before heading to the Gulf of Aden to participate in anti-piracy operations. A month later in October, the Indian government quietly launched an inter-ministerial review exercise to revisit India’s policies for the Indian Ocean. This followed on the heels of China’s proclaimed Maritime Silk Road, its growing influence around the Bay of Bengal, and the development of the Pakistani port of Gwadar, which is to be operated exclusively by Beijing. Glimpses of this exercise were seen the same month when Modi visited Myanmar, Australia and Fiji. China is the biggest foreign investor in Australia, and has liberally provided economic aid, loans and investments to Myanmar and Fiji. A few weeks later, China docked two of its submarines again in Sri Lanka. Calls for a reworking of India’s Indian Ocean strategy had been brewing within the strategic community for some time. The new government took some initial steps within months of taking power in New Delhi, with the Shipping Corporation of India launching special container trade lanes with countries such as Myanmar. External Affairs Minister Sushma Swaraj’s visit to Maldives was also aimed at strengthening the Indian Ocean Rim Association (IORA), an organization set up in 1995. A subsequent visit to the UAE, also an IORA member, was made with the same intention. More than 70 percent of India’s liquefied energy supplies travel through the Indian Ocean, making it vital to the country’s security. Close Indian allies such as Japan, which is now setting up a permanent anti-piracy outpost in Djibouti, also source vast quantities of natural gas and crude oil from the Middle East, which travels through the Indian Ocean towards Japanese shores. The international community is also trying to rapidly extend security from the Indian Ocean to the Arabian Sea and Bay of Bengal. The news of Rajapaksa losing the elections was greeted with much enthusiasm in the Indian media even as the government responded with the routine declaration that it would work with whichever government the people of Sri Lanka decided to choose. It is no secret, though, that India is looking more than confortable with Sirisena at the helm in Colombo. China had been building its base of influence in Sri Lanka since 2009, when the Rajapaksa government ended its bloody crackdown against the LTTE in the country’s largely Tamil populated north. While the Sri Lankan government was the target of global protests over alleged human rights violations against the Tamils, Beijing stood by Colombo and began providing it with huge loans at liberal terms, albeit with high interest rates. According to statements made during pre-poll campaigning, Sri Lanka picked up major loans for projects from countries such as Japan, Kuwait and China. Japan and Kuwait, on average, offered loans at rates of 0.2-0.3 percent. In contrast, the interest rate on the Chinese loans exceeded 3 percent. Rajapaksa’s government chose Beijing over conventional lenders such as the World Bank or the International Monetary Fund. Using Chinese funds, totaling nearly $5 billion since 2009 (compared to India’s $350 million over roughly the same time frame), Sri Lanka was able to boost its growing services sector by investing in infrastructure projects such as highways, public amenities, and ports. China enthusiastically partnered with Sri Lanka in a $1.5 billion port project in the southern coastal town of Hambantota, one that India had vehemently opposed. Chinese loans are also being used to build a new international airport in Mattala. Sirisena, in his pre-poll campaigning, had said that he would put a stop to the unchecked inroads that China had made in the country. Since taking over, his government has already stated that it plans to reassess the port project, a decision that will resonate positively in the Indian capital. The new government has apparently already made the first moves to rebalance towards Delhi, with the new Sri Lankan foreign minister, Mangala Samaraweera, making India his first port of call. Meanwhile, Sri Lankan Prime Minister Ramil Wickramasinghe in a recent interview said that “Rajapaksa played China and India against each other in Sri Lanka,” and that the new government will look to fix this. However, India’s ambition of checking Chinese influence in Sri Lanka by influencing Colombo to abandon, or at least minimize projects, may not be an easy task. For Sri Lanka to ignore China could be next to impossible. Sri Lanka today owes China billions, and in some cases, according to sources, significant sections of these loans did come with certain sovereign guarantees that were agreed between the two countries. These guarantees today give Beijing significant political advantages in Colombo irrespective of who is in power. This situation makes it difficult for the new Sri Lankan government to renegotiate with China the projects and loans already signed off by the Rajapaksa administration. Beijing has leverage, which it will doubtless use to prevent Sirisena from diluting the influence China had built under the previous regime. At any rate, China is too large an economic entity for any country to actively sideline. The art of managing Beijing’s economic assertiveness is not easy to master, and requires political will and skillful diplomatic maneuvering. A recent example of the challenges has been witnessed in Myanmar, where the government reportedly decided to clamp down on the pace of Chinese economic and cultural infusion after it was found that Chinese language had started to overshadow Burmese in Yangon. Rajapaksa’s policy of enjoying the best of both worlds was clear, as Japan remained Sri Lanka’s largest lender, even as China managed to build a strong political constituency in India’s neighborhood. The new Sri Lankan government will find that it has its work cut out just containing Chinese influence in the country, let alone fulfilling the Indian dream of eliminating it altogether. The growth of Chinese influence in Sri Lanka may slow, but Beijing is in the region for the long haul. 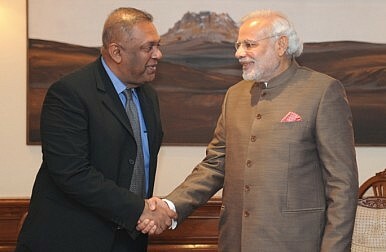 It is up to India to turn this political change in Colombo to its advantage. Kabir Taneja is a journalist covering Indian foreign affairs and energy sector for The Sunday Guardian, The New York Times (India Ink), Tehelka, The Indian Republic and others. He is also a former scholar at The Takshashila Institution. A New Era for India-Sri Lanka Relations? A recent visit has encouraged optimism, but India will struggle to counter China’s influence.